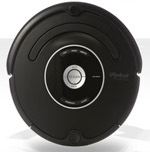 Yesterday I brought an iRobot vacuum cleaner home. I told C about it some days in advance, and she didn’t object. We have enough to do without vacuuming all the time, and with 2 rug rats around, the floor needs a lot of cleaning these days. This morning we started it for the first time and watched the lill sucker move about in its odd patterns. It doesn’t clean logically like a human would, but it still does an acceptable job and eventually gets around before the cycle is over. I told C: “It may not replace normal vacuum cleaning, but it does take at least 80-90%. So it is a huge help and in the end it’s better than I’d have thought”. She glanced at it hum around on the floor and replied: “It’s more thorough than you”.